We know picking the perfect groom suit can be a daunting task, with so many variations and styles available, narrowing down your options can be difficult. In reality, most men can go through life sticking with only one or two really good suits with others never owning or even coming close to owning a tailor-made suit, that is, until the wedding day comes along. For something that seems so uniform, you can be forgiven for making the assumption that it’s a simple task - how hard can it be to pick out a good two-piece to match the theme of the wedding? 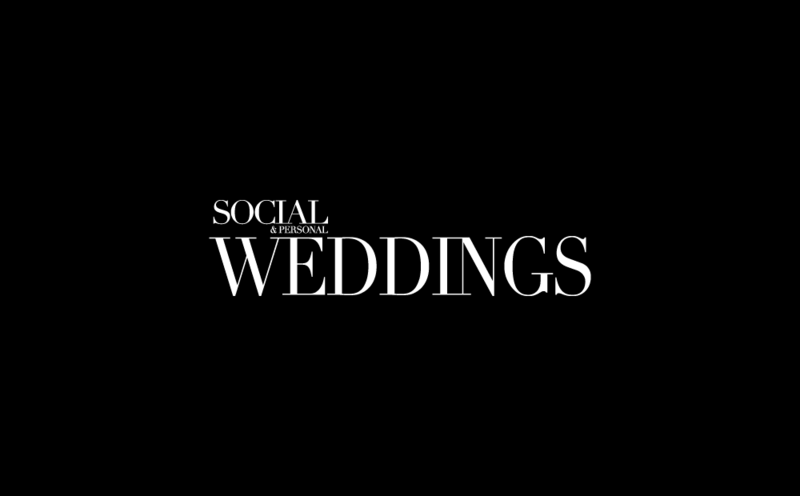 Well, not to overwhelm any grooms here, but there are a lot of considerations that need to be made before you can actually choose the right suit. Firstly, there’s deciding on the style; for example, do you want a three-piece including a waistcoat, do you go for the classic tuxedo or maybe even incorporate a blazer? What accessories do you include, cufflinks, boutonnieres, suspenders? Do you want to wear a tie or a bowtie? Regardless of your experience or personal tastes, we have compiled the ultimate checklist to ensure that you get every little detail right - from the tricky measurements and sizing ratios right down to the style of cufflinks you want. - When it comes to the width of your jacket, skinny lapels are currently on-trend, whereas wider, broad jacket lapels are seen as more old-fashioned. - For a guaranteed sense of modernity, yet still keeping that old-fashioned charm, a three-piece suit with an included waistcoat is always the perfect combination. - It’s considered more stylish and chic to keep the bottom button of a waistcoat unbuttoned. - Shoulder pads should never stand up above the shoulder or jut out of the frame of your torso, they should simply end just before the shoulders do. - If you opt for a mismatched outfit, coloured suit, or even decide to forego the jacket altogether- all of which considered to be the ‘contemporary casual’ groom look - try incorporating shades of brown or grey as these are more subtle and still a flattering, formal shade. - Another firm favourite in the casual style department is tweed – either in the pants, the jacket or even just the tie, a tweed-style suit will lend a whimsical air while still keeping you stylish. - A tuxedo will always remain a classic, but one that you can mix up and modernise a little by including a tie instead of a bowtie or a pop of colour in the pocket square..
- Always make sure your tie is a darker colour than your shirt for a more elegant finish. - The cuffs of your shirt sleeve should be showing half an inch out from the sleeve of the jacket. - There should be no gap between the lapel collar of your jacket and the collar of your shirt around your neck – they should sit comfortably and snugly together. - For perfect balance and symmetry, the width of your tie should match the width of your jacket lapel. 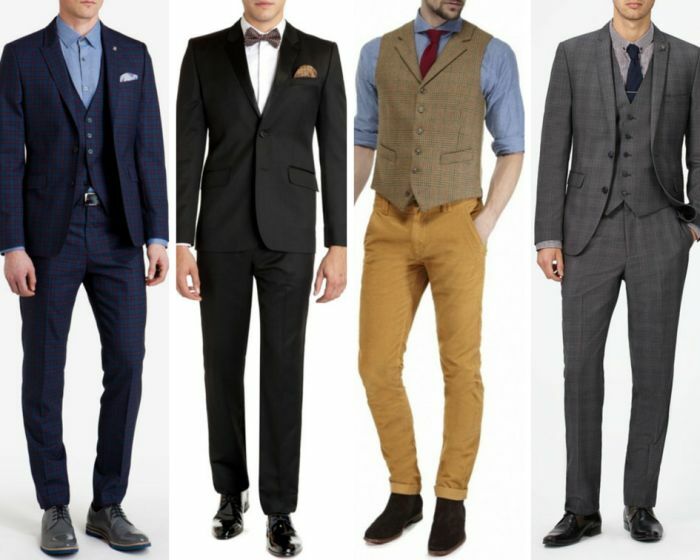 - The tie length should reach just the beginning of your suit pants and be no longer. - The jacket of your suit should be fitted as close to your chest so that there is enough room for you to slide your hand inside your chest pocket, but not enough to extend your hand outwards from your chest. - Always remember to unbutton your suit jacket when sitting down – it will look better and ensure that the suit is free from wrinkles and any potential damage. - It’s always useful to keep a little lint roller on hand somewhere at the reception – you never know when you or the bride might need it. 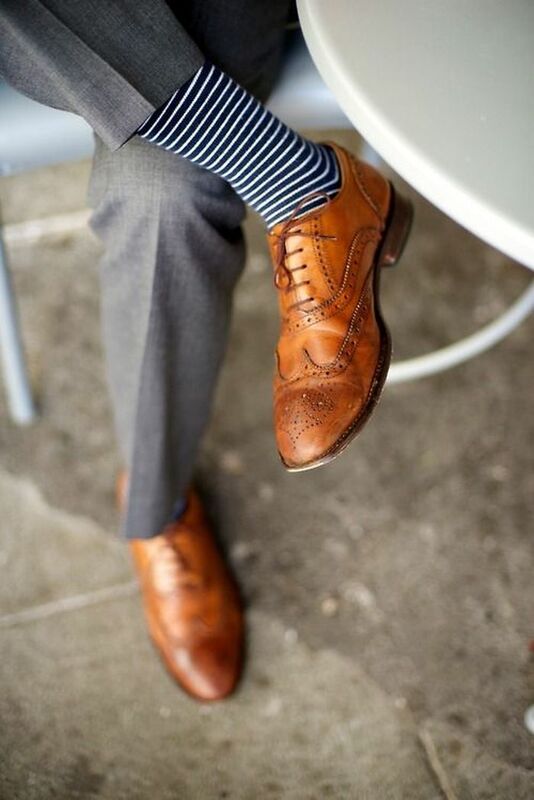 - Make sure your socks – however colourful or plain they may be - reach just below the knee so as to cover your exposed leg when you sit down. 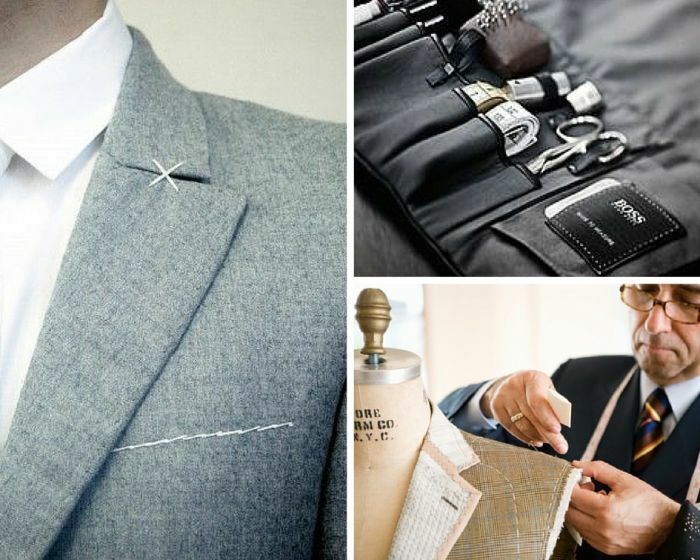 - Try have a little fun with your accessories, they are the one feature of your suit that you can personalise and play around with. 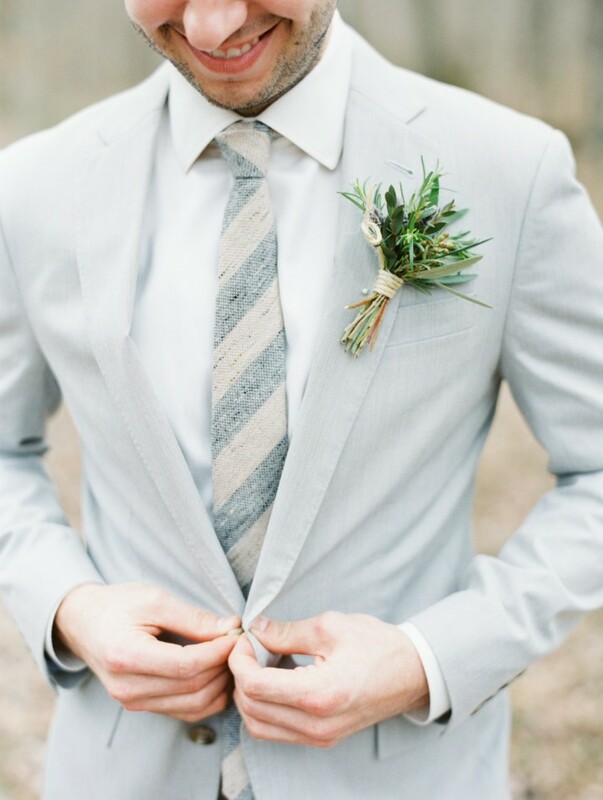 - We've already mentioned the different ways you can accessorise the boutonniere – from photos to favourite movie characters. 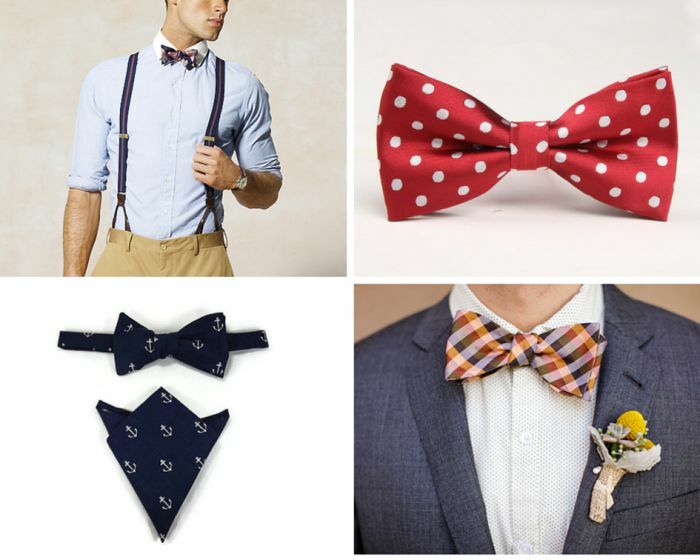 - Bowties and pocket squares are a great option to add in a bit more colour and variety to your outfit. Choose to make them bright, patterned and customised to give your suit that extra flair of personality. - Similar to the bowtie, cufflinks are always a great way to customise your suit to fit your own style, and they also work great as gifts for fellow groomsmen. Personally, we're big fans. - If you have opted for the casual groom look, then suspenders will be your next best friend, after the tweed and bowtie of course. They add a sense of old world charm and are the perfect style accessory to include if you’re looking for a cheeky edge. - Make sure your shoes match colour of your belt – and if you want to be extremely suave, then add a similar toned watch for a completely polished appearance. - We are huge fans of the stylish brown brogue as a groom shoe for the wedding day. While black will never go out of fashion, don’t be afraid to mix in a little brown or grey toned shoes in your outfit, as long as you coordinate with at least some of your suit's accessories then these stylish dress shoes won't be out of place. Image Credits: Groomsmen: Pinterest | Style Suits L-R: navy check suit: Ted Baker, black tuxedo: Ted Baker, tweed vest : Jules B, grey three piece: Burton Menswear | Suit tailoring L-R: grey suit: Pinterest, tailoring kit: Hugo Boss, tailor at work: Saxony Fine Clothing | Groom shoes: Pinterest | Accessories L-R: bowtie and suspenders: Style to the Aisle, polka dot bow tie: Etsy, nautical bow tie and pocket square: Etsy, checked bowtie: OneWed.